My family and I would like to extend our thanks for the helping our daughter to pass her test. Without you I don't think she would have passed the test. and go through your driving school, because I have 1 more daughter that is getting to that age where she is going to be driving soon. Greg passed his driver’s test with flying colours! The examiner said that his driving was exceptionally good. Only one error (failing to shoulder check in a cul-de-sac).Thank you so much for your excellent instruction. You have a significant gift for putting people at ease and encouraging them. Russ, Thank you again for teaching Jenna to drive. Your patience and calm demeanour are a great asset with nervous your drivers. You gave her the knowledge and confidence to be on the road by herself. Your service is very reasonably priced which helped us to give her a lot more lessons than she would have got elsewhere! We are proud to tell our friends and family that Jenna passed with 100% on her road test!!! That gave her a lot of confidence about her abilities. We haven’t seen much of her since the day she got her N! I would be happy to recommend you to anyone I know who needs to take driving lessons! See you for the Class 5 brush up!! Hey Russ, thanks a lot for your help during my practice for the road test. Your knowledge and teaching ability really helped me to pass the test in the first attempt. Wish you all the best! I would highly recommend Russ as a driving instructor. We contacted Russ and he accommodated our request to provide specific driver training. Our son had already had many driving lessons where he learned good driving skills but he had developed a habit and a mind set of making judgment errors when making left turns and was too hesitant when making right turns. He failed the driving test 2 times as a result of these habits. Russ coached him to make better decisions and assessments when driving. After each class he spent time explaining in detail what areas needed practice and helped to extinguish that mind set that was preventing our son from gaining the confidence he needed to pass. Thankfully 3 times the charm and with Russ's coaching our son is now a new driver. At first I was scared to start driving and was very sceptical about taking lessons. Once I decided to go for it and had met with Russ, I began to look forward to my lessons. His teaching method was comfortable, informative and very practical. With Russ’s guidance and patience, he taught me to be the confident driver I am now. Russ was not only my teacher, but he became my friend. I would highly recommend Russ as a driving instructor, particularly for people like myself. I really liked Galaxy Driving! If your hands are shaking when you are driving, I recommend Galaxy Driving. Russ will help you drive well! I only had 5 lessons and passed the road test the first time! If you listen to what he says and remember what he teaches you, you will pass the road test! Thanks again to Russ! I will tell my all friends who have a road test soon! It's an honor for me to give my heartily comment on this website. To be honest, three times I failed the class 5 road test, but when Russ helped me as my road test lesson Instructor, I passed! With his dedication on teaching students the best he can in driving, you feel confident on how you drive.! Every now and then on your lesson, He sketched on how you handle the situation on the road! He's not just an instructor but a friend as well! New car to use on driving lessons and affordable rates! Thanks again for all the help Russ! Couldn't have done it without you! 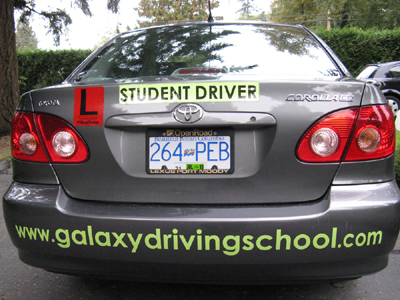 I would recommend Galaxy driving school to anyone who wants to learn how to drive and feel confident driving. Russell is an excellent instructor who is committed to teaching proper driving techniques and safe driving in a simple and easy to understand way. He cares about his students passing their tests and makes sure you're well prepared. What really got me was that I was able to find such a quality driving school for such a good price! Thank-you for the driving lessons you gave our daughter. You did an awesome job. You made her feel comfortable and confident for her test. We will be passing along your name to everyone we know needs lessons. My sister will be contacting you soon for her daughter. Thanks a lot for all the help you gave me in each lesson. It was great that you were patient and calm which helped me being a better driver. I am thankfull that you stayed at ICBC untill my driving test was done. become a better driver. Thanks a lot Russ!